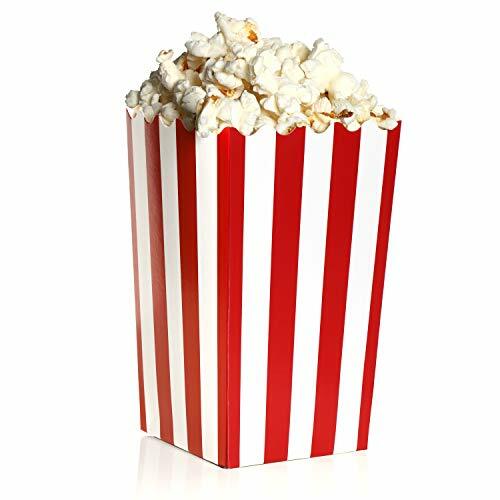 Get our classic old time looking red and white stripped popcorn bags today! Great for parties, school fundraisers and so much more. 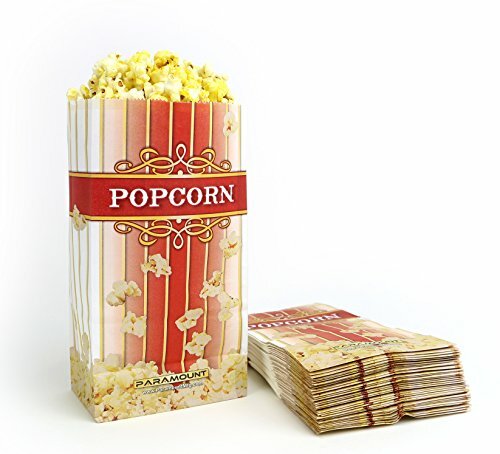 Our 1 oz bags holds 4 cups of popcorn, comes in a pack of 100, with no logo prints on the back side for versatile use! Stock up yours today. Brand: Bottle Buddy | Manufacturer: Tailor Made Products, Inc.
1 oz popcorn bags with eye catching design. Each package contains 500ct 1oz bags that are convenient to-go option for your customers. Great for fairs and carnival themed parties. 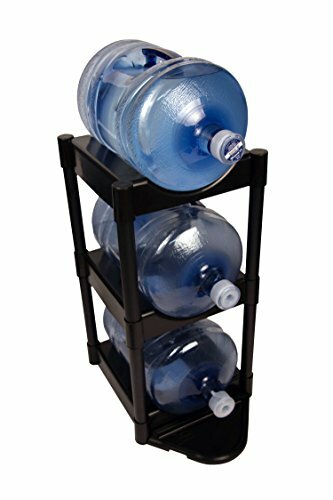 A great replacement for plastic containers, bowls, bags and buckets. 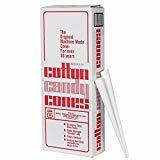 This funtime, classic designed box will be a big hit in your home theater, Halloween, Christmas, baby shower or birthday party. Our premium, professional box makes a great companion or gift to our Salbree, microwave popcorn maker. 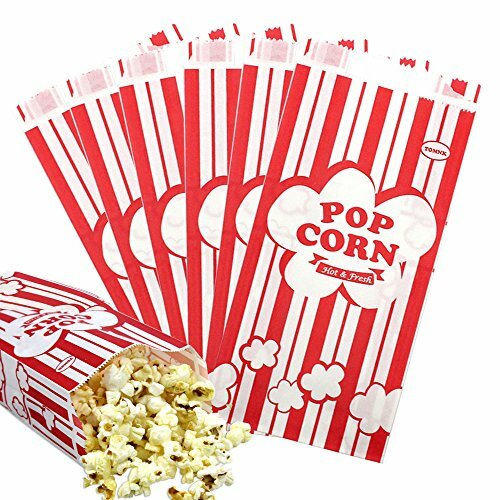 If you have a popcorn machine and cart or a vending service, you should consider our plain, BPA free, colorful packaged accessories. This variety pack is tiny on price, but mighty on value. ADD TO CART AND BUY YOUR TODAY!!! You will get a pack containing 100 high quality bags and with eye-catching popcorn letter design. 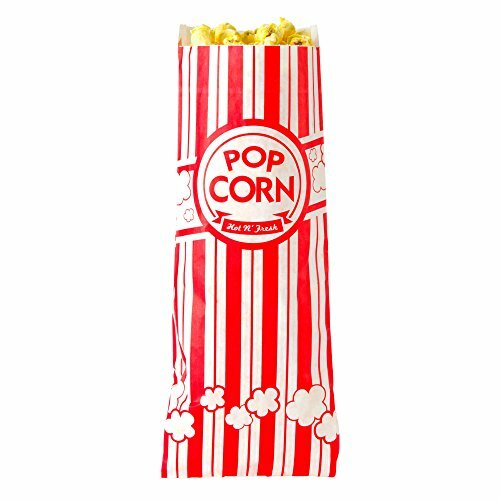 Size: 22 * 10 * 5cm Material: 40g food-grade oil-proof paper Package contains: 100 popcorn paper bags Eye-catching classic popcorn style design to add atmosphere to your carnival, dating, party, etc. Why pay an expensive cup when you can use these nice and practical popcorn paper bags for your carnival or date! 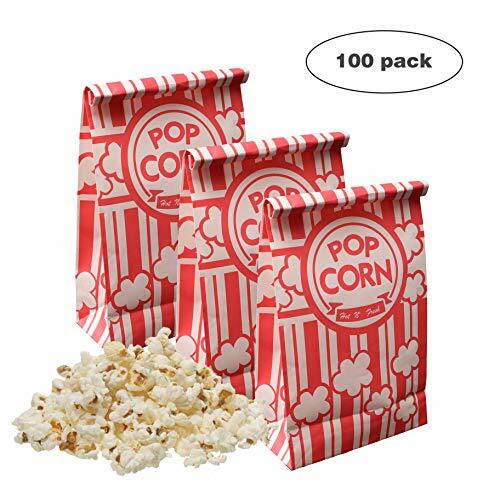 Pack of 100 high-quality popcorn paper bags. Made of food-grade oil-proof paper, safe and secure. Classic popcorn red and white design. Suitable for carnival, theater, party or school fundraising and other special events. 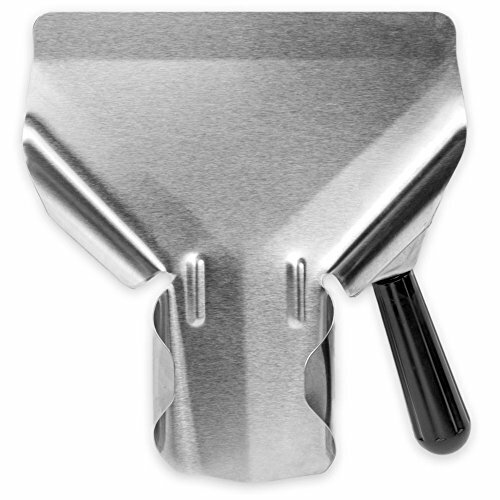 Stainless Steel Popcorn Scoop Easy Fill Tool for Bags & Boxes, Great Utility Serving Scooper for Snacks, Desserts, Ice, & Dry Goods by Back of House Ltd.
What event isn't made better by a little popcorn? With a popcorn scoop you'll serve delicious, buttery popcorn to the masses as efficiently as possible. Our popcorn scoops are made to fill bags, boxes, and bowls in seconds. Hold the non-slip grips and scoop up popcorn and other treats with ease. Don't stop at popcorn, serve French fries, candy, desserts, and dry goods, even use it to scoop out ice. These classic scoops are used in movie theaters, restaurants, and candy store as well as at special events such as festivals, carnivals, and weddings. This utility tool measures out to 8.75" x 7.75" x 1.5" and is made of hardy, corrosion-resistant stainless steel. They're no hassle and dishwasher safe, no flaking, chipping, or discoloring over time. When you need to serve popcorn quickly and efficiently, a popcorn scooper is a must have tool. Hold the scooper by the handle, scoop popcorn, attach a bag to the scooper, and fill your bag in seconds. Making treats to sell or give as gifts? Scoop out your treats, put them into packaging, and put them onto shelves or send them to loved ones. SALTY TREATS & SUGARY SWEETS: Serve delicious, buttery popcorn with a speedy popcorn scoop. Treat yourself and others to salty and sweet treats alike! EASY-FILL DESIGN: Made to fill bags, boxes, and bowls in seconds. Comfortably hold the ergonomic, non-slip grip and scoop out treats, quick and simple! 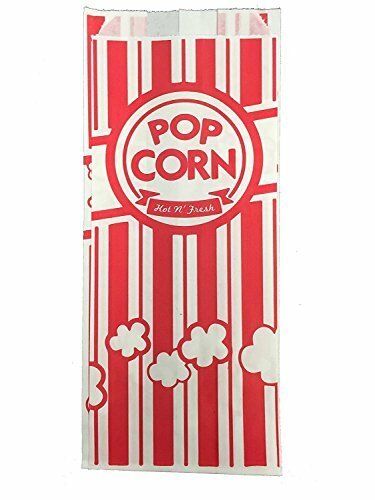 Brand: Back of House Ltd.
- These popcorn gift bags can fold flat and only take up very little space on the shelf or at your kettle corn stand. - Eye-catching red vintage design you can incorporate into festive table decorations, add atmosphere to your carnival, dating, party, etc. - Easy to hold in one hand. 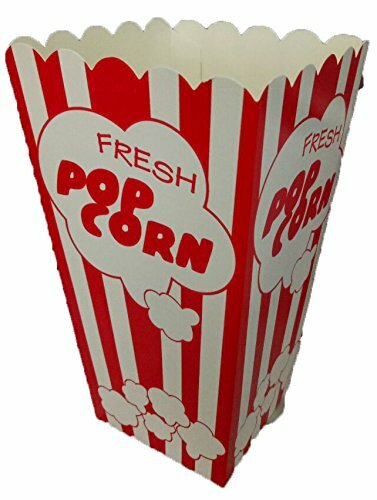 Our popcorn snack bags are ideal for festivals, concerts, theater, movies, fairs and other events where people will be moving around. You can easily hold this bag popcorn in one hand while walking around the venue. If you are in the market for apopcorn popper, stop looking! These commercial quality machines featurestainless steel food-zones, easy cleaning stainless steel kettles, anold-maid drawer (for unpopped kernels), tempered glass panels/doors anda 8 ounce kettle operating on 860 watts. The antique style designevokes memories of early days at the ball games, carnivals, or themovie theater. We have combined the best of both worlds - not only areyou getting today's technology, you get an authentic design with allthe conveniences of the modern era. We have sold thousands of theseunits to churches, schools, businesses, day care centers, varsity/PTAclubs, and more. Of course, our #1 customer is the home owner lookingto add a theatrical effect to their home theater. BONUS!We include FREE 3 plastic serving cups, 25 popcorn serving bags,measuring cups and a popcorn scoop with every popper! 8Ounce Kettle: ThickerGlass: - 40% thicker than ourcompetition PremiumGrade Steel - 30% thicker thanour competition RicherColor - Premium paint andenhanced colors SaferPacking - double wall stock andextra packing to ensure a safe delivery Robust Design/Craftsmanship backed up by an industry leading 5 year warranty on the machine and a 30 day limitedwarranty on all consumable parts including kettles and/or light bulbs. Gold Medal Cotton Candy Cones are the strongest cones available! Packaged 1,000 per case. SALTY OR SWEET. YOUR DECISION: Open top access provides easy access to your salty or sweet popcorn. 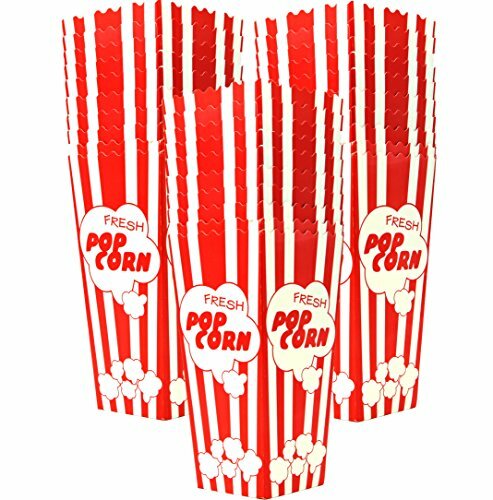 Use these popcorn containers and share with your buddies on movie night or get-togethers! SIMPLE ASSEMBLY: To pop-up each box, simply push inside the container and pop the bottom of the box out, so the box is opened up. 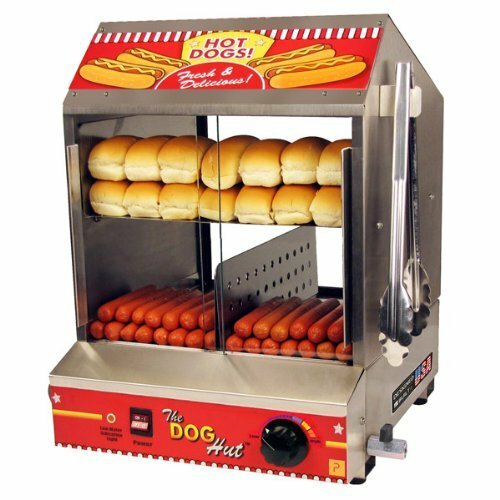 The Dog Hut is manufactured to set the standard par excellance for hot dog steamers. Built with heavy-duty 20 gauge stainless steel construction makes The Dog Hut the most durable steamer and it accommodates up to 200 hot dogs and 42 buns. Removable product trays and sliding doors allow for easy access to hot dogs and buns and makes for simple easy clean up. The proprietary heating system featuring heavy-duty submersible stainless steel element and automatic shutoff feature should the water get too low. The over-sized eight quart water reservoir is the largest available. The quick turn water release valve eliminates burned fingers and spilled water. Low water Indicator light and illuminated ON/ OFF switch along with a variable adjustable thermostat are standard. The divided hot dog tray accommodates any size hot dogs and sausages and allows for various sizes of hot dogs or sausages to be cooked and merchandised simultaneously. The product trays and sliding doors are dishwasher safe. Its variable adjustable thermostat allows the operator to adjust according to the demand. Includes stainless steel tongs. Capacity: 200 dogs or sausages and 42 buns. Great Northern has created a master piece with their new 12 Ounce Commercial Quality Pop Heaven popcorn machine. This machine has revolutionized the industry with it's sleek styling, extra large kettle capacity, and extra large popcorn yield. 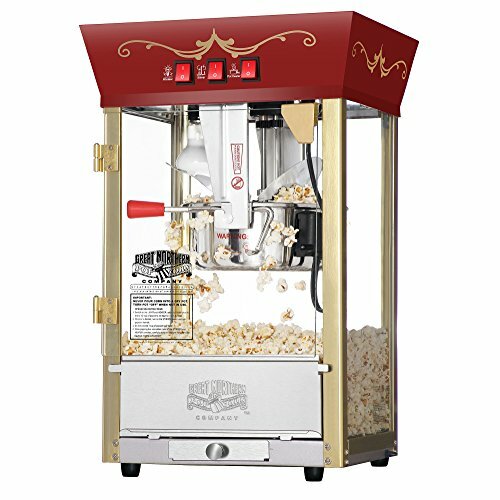 For years you could not buy a commercial quality kettle (12 Ounce) popcorn machine that would run off 110 voltage and was priced under $500--NOW YOU CAN! The Pop Heaven is perfect for churches, schools, kid clubs, varsity clubs, concessionaires, and anyone else looking to pop more corn and increase their yields. If you are in the market for a popcorn popper, stop looking! The Pop Heaven is our largest popcorn machine and a proven performer. The 1350 watt kettle heats/cooks the popcorn quicker than our other machines and the larger size holds much more popcorn. These commercial quality machines feature stainless steel food-zones, easy cleaning stainless steel kettles, an exclusive warming deck, old-maid drawers (for unpopped kernels), tempered glass panels and an industry leading 12 ounce kettle operating on 1350 watts. With the sleek style design, you will be reminiscing about your early days at the ball game, carnival, or the movie theater. We have combined the best of both worlds--not only are you getting today's technology, you get an eclectic design with all the conveniences of the modern era. A couple of conveniences worthy of note include our exclusive old-maid drawer. Our machine was designed with small perforations in the bottom stainless tray to allow the un-popped kernels to fall into the drawer. Simply "rake" the popped corn with a scoop and the "old-maids" disappear. We have sold thousands of units to churches, schools, businesses, day care centers, varsity/PTA clubs, and more. Of course, our #1 customer is the home owner looking to add a theatrical effect to their home theater. BONUS! We include FREE 3 plastic serving cups, 50 popcorn serving bags, measuring cups and a popcorn scoop with every popper! 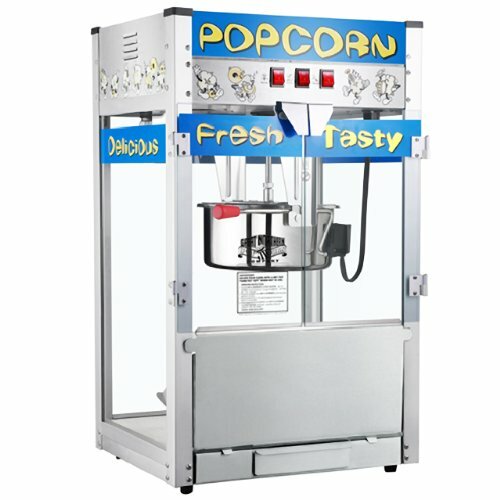 Why buy a Great Northern Popcorn machine? MULTI USE: Fits select toy machines, mini bath bomb molds or inserts, party gifts, DIY activities, classroom fun and more! 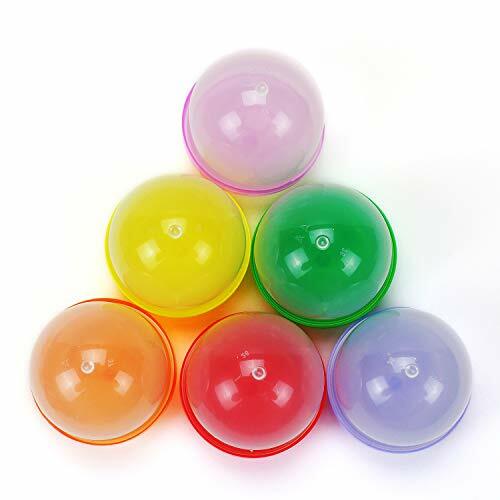 Industry-standard 1.1 inch Vending Machine Capsules are designed to hold rings, stickers, charms, bracelets, balloons, dice and any other small item. Each capsule is approx. 1.1 inches in diameter and stands approx 1.25 inches tall with the lid on. Each capsule is made up of a soft clear frosted bottom and a colored top. Lids will come in a varied assortment of colors. The colored lids are premixed and packaged at random. These fun capsules come empty and unassembled; ready to be filled with your favorite prizes. Mid Cities Sales is the sole provider of Avend vending capsule products. We cannot be responsible for products sold by other vendors on this listing. Search Amazon for other Avend vending products. AN ASSORTED MIX of colored lids in every package! 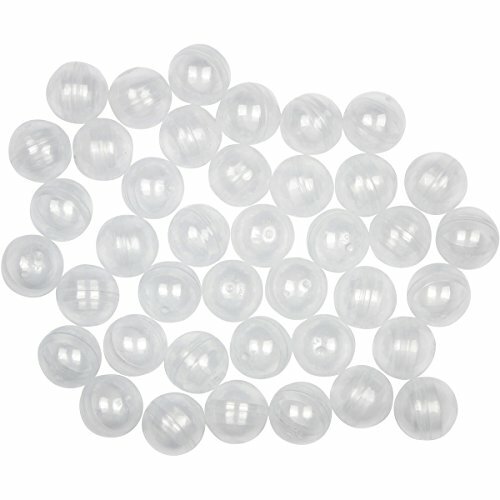 SOFT PLASTIC clear frosted capsules provide greater safety than clear brittle polystyrene capsules. Tight fitting colored lids provide secure vending and storage. EXCITE YOUR KIDS in school or on Easter, Valentines Day, Halloween and birthday parties with miniature toys and candy prizes. Great for rewards, party favors, treasure hunts, VBS, contests, pinatas, sandbox and beach explorations! FIND IT FAST with these color-coded storage containers! Perfect as storage containers for tiny parts and screws! Use to store beauty products and arts and crafts items. 100's of uses! These Mini Popcorn Boxes are perfect for all sorts of snacks and treats! Whether you're setting them out at summer picnics, outdoor concerts or handing them out to guests to give your movie night a more authentic theater feel, these paper boxes are a wonderful addition no matter what you have planned. (2 dozen per unit) 3" x 3" x 4" Simple assembly required. 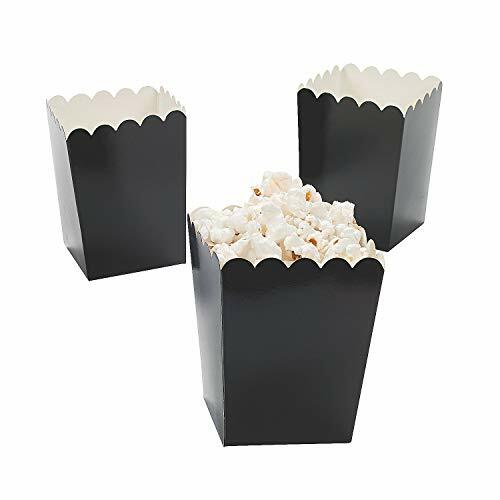 These Mini Popcorn Boxes are perfect for all sorts of snacks and treats! (2 dozen per unit) 3 x 3 x 4 Simple assembly required. Great for summer picnics, outdoor concerts, movie nights, and so much more! 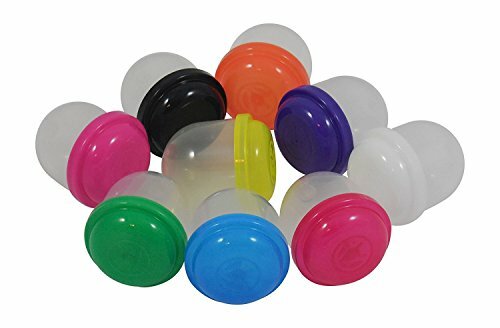 Bag of 100 Empty Acorn Vending Capsules with Assorted Color Lids (May be 1 color). You fill with your favorite 2 inch vending toys or promotional products 2 inch diameter. Clear dome makes easy viewing of your item. Easy snap on assorted color lids. Also available by Case of 250, 500, 750, & 1000.